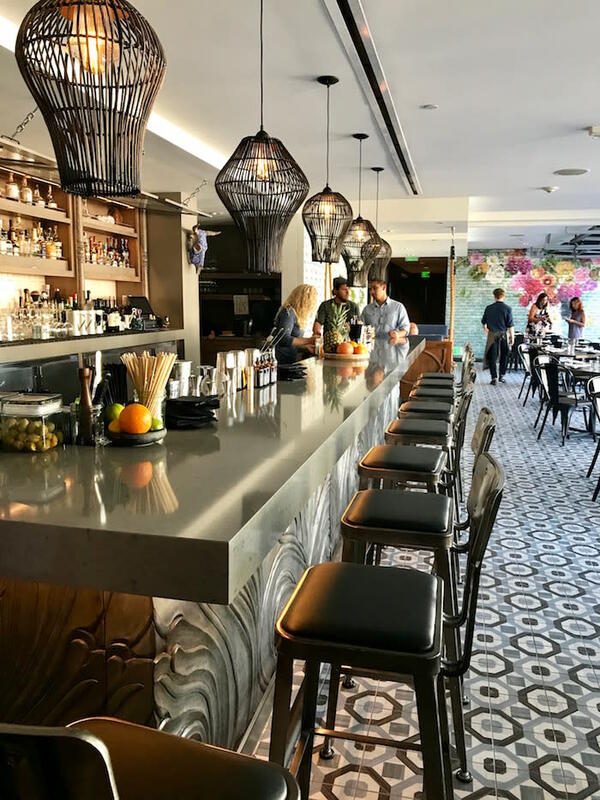 The Kimpton Shorebreak Hotel is undergoing a major $3 million renovation, and part of their facelift includes a new Pacific Rim-inspired restaurant, Pacific Hideaway. 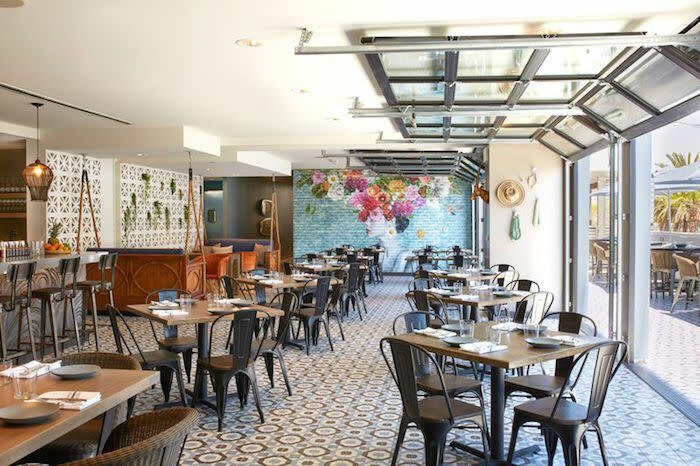 Freshly opened on May 2, the elevated surf shack features mid-century modern and global decor, island flavors and colorful plates, and a refined yet laid-back bar experience. 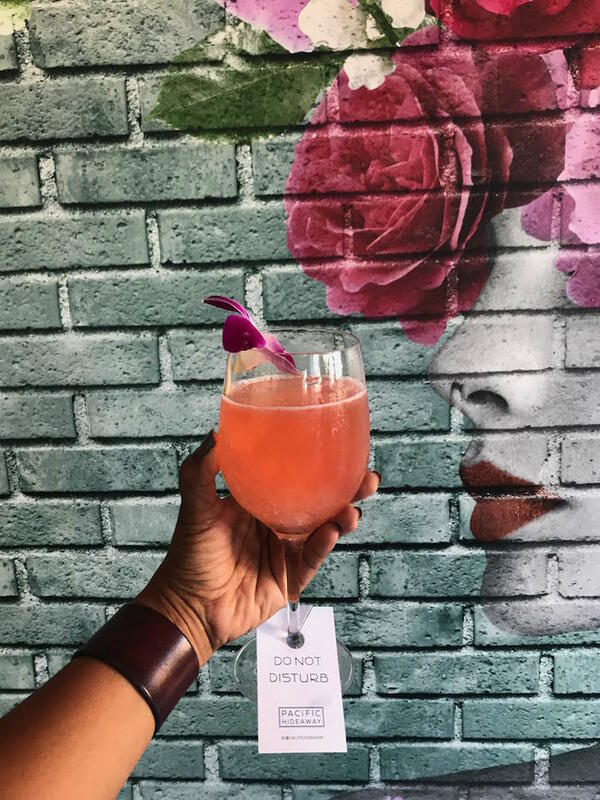 We caught up with Director of Food & Beverage Blake Mathias and Lead Bartender Casey Lyons—formerly of Huntington Beach’s 25 Degrees and Costa Mesa’s SOCIAL—for details on Huntington Beach’s newest dining and cocktail adventure. 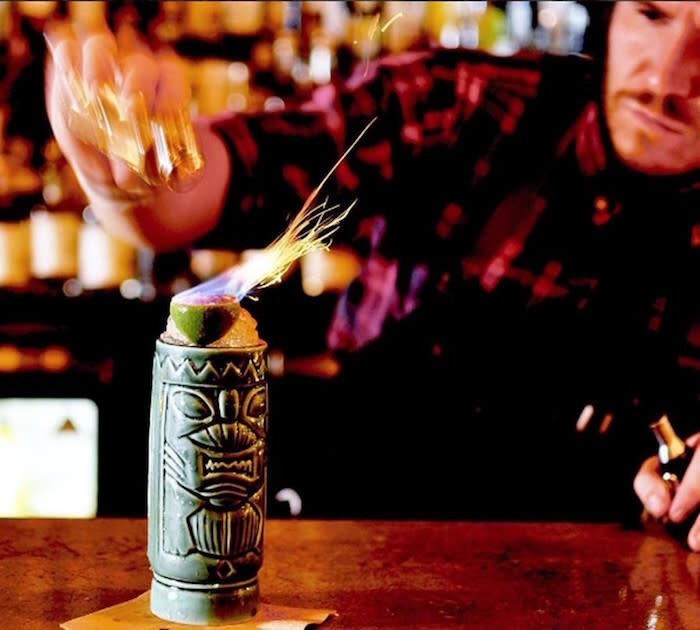 1) Visit Huntington Beach: What sets Pacific Hideaway’s libations apart from other spots in Huntington Beach? 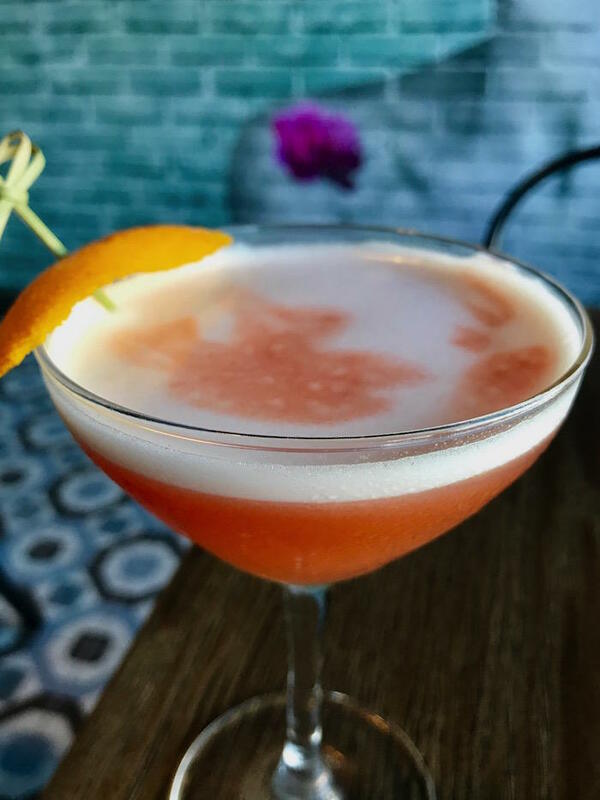 Casey Lyons: To put it best, they’re meant to be craft cocktails that make fun of themselves. No pretension, just good products and funny names that’ll put a smile on your face. 2) What should guests expect at your bar? CL: We have drinks that are smoked in Spanish sherry-style porrons, and a cocktail named “Dazed and Confused” that has a sage and oregano doobie clipped to the side of it that is lit upon the drink being finished on the way out to the guest. The beer program is meant to be along the same concept as the food: different surfing spots all over the Pacific and brands we thought spoke to that vibe. All very focused on the fact that it’s now May and a nice warm 80 degrees. Lots of different flavors and fruits—nothing too heavy. Blake Mathias: We’re featuring Orange County. We didn’t want to be like everybody else. The thought process was to feature some Orange County locals in and of the area—places like Pizza Port. You think of these different things that play to our ultimate muse of the hotel, which is Bodhi. He’s this chic surfer dude who’s a pretty successful salesperson and who goes up and down the coast and surfs. That was the whole idea behind crafting the cocktails and the beer program. It’s not hoity-toity and it’s not your everyday find. It’s just meant to be that really unique “holy cow, I’ve never had this watermelon wheat beer before!” or “I’ve never had this peach ale before,” which really speak to the season we’re in, being summer. 3) Casey, favorite cocktail on the menu? CL: Favorite cocktail on the menu changes just about every day because I’m trying to fit it to the person. Right now we have a cocktail called “Safe Word,” which is supposed to be your safe spot on the menu if you think everything underneath it is written in another language. It’s a half vodka, half gin and tonic with elderflower and grapefruit. 4) Suggest a food and cocktail pairing for diners. CL: I would say the “Do Not Disturb” [sauvignon blanc, aviation, sparkling wine, honey, lemon—garnished with an edible orchid and a mini “Do Not Disturb” sign hanging from the glass stem] and the Tuna Crudo [raw tuna, smoked eggplant, lime leaf, crispy shallot]. 5) Blake, tell us about the restaurant’s design concept. BM: We looked at the space and said, “What can we do? We need to embrace the fact that we are on the beach in Southern California.” The design is meant to be a reflection of its name; we’re found on Pacific Coast Highway next to the Pacific Ocean. We blew out the entire side of the wall, so the garage doors really give that indoor/outdoor California feel. The ocean breeze circulates through the restaurant and into our lobby and courtyard, so you get this everlasting flow of energy. The color scheme is very mid-century California with pastel blues, a succulent wall, and Frida—these bright, lavish, pastel flowers coming off of our back vinyl statement wall. 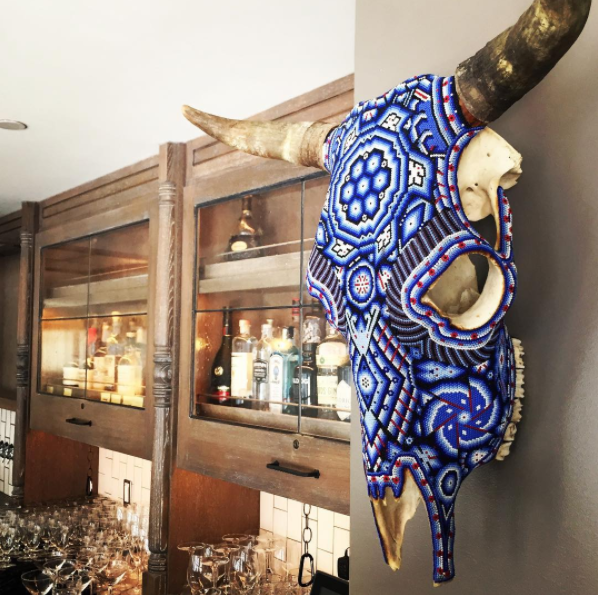 Then we have funky, bright animal heads, like our big blue bull skull above the bar, which is ironic given “mess with the bull, get the horns.” Theresa Fatino is our designer, and I could not be more proud of the unbelievable design she put together. 6) How would you describe the menu that Executive Chef JT Walker has created? BM: Chef JT has been working his tail off on this menu. He&apos;s from Orange County with Filipino heritage, and he fishes when he has spare time, which is never. But when he does, he&apos;s a fisherman on the Pacific Ocean. You can feel the love and passion he&apos;s put into this project. 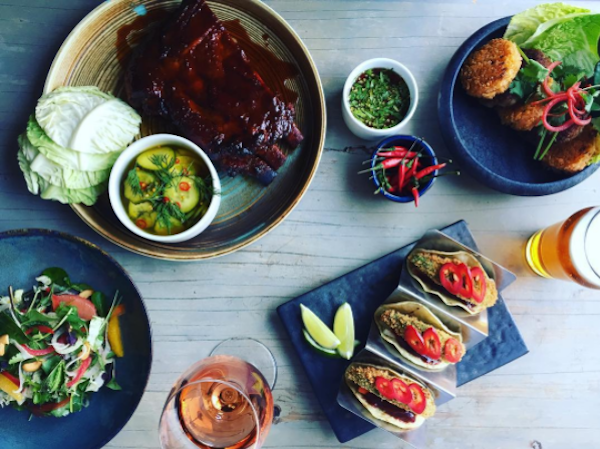 You take the Southern California coastal cuisine, those farm-to-table, fresh ingredients and coastal selections, and then add flavors that are so similar but so starkly different in Latin and Asian cuisine. 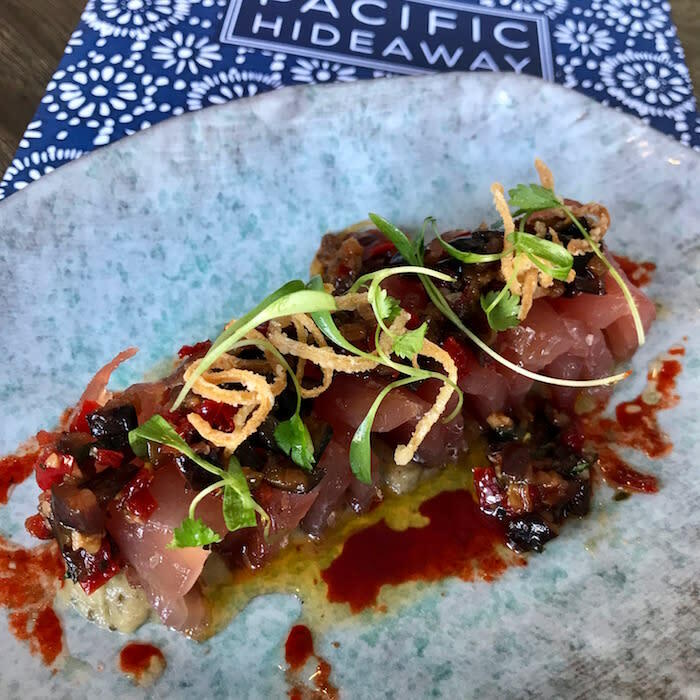 It really creates a Pacific experience that I’ve never been a part of, from the deep, rich cumin flavors on the menu and the robust Szechuan Chinese spices to his Thai Snapper, our featured dish. 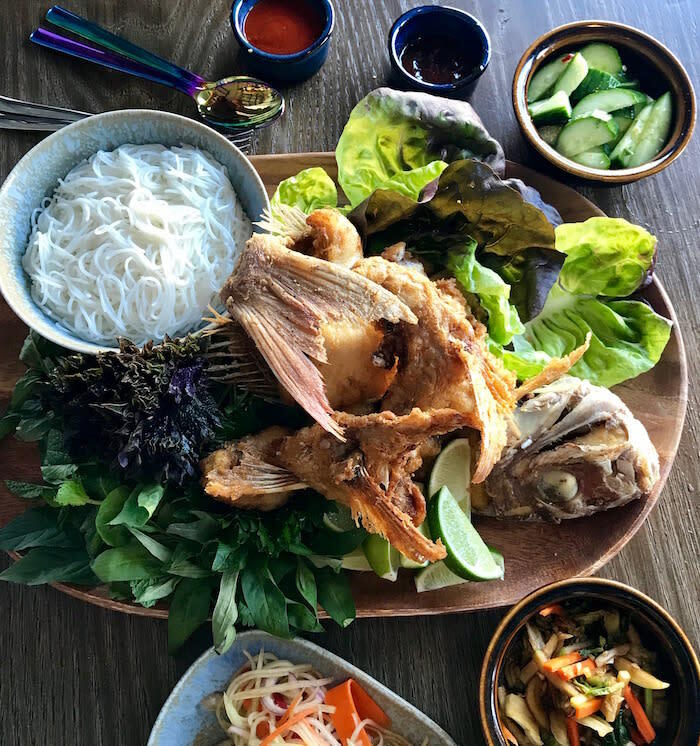 It’s a filleted and whole-fried in lime salt red Thai snapper, which is indigenous to the area, served with a smorgasbord of ingredients, from fresh Thai basil and different types of cabbage to a mango papaya salad and house hot sauce. And you’re making these gourmet lettuce wraps that literally hit your mouth with this overabundance of flavor. 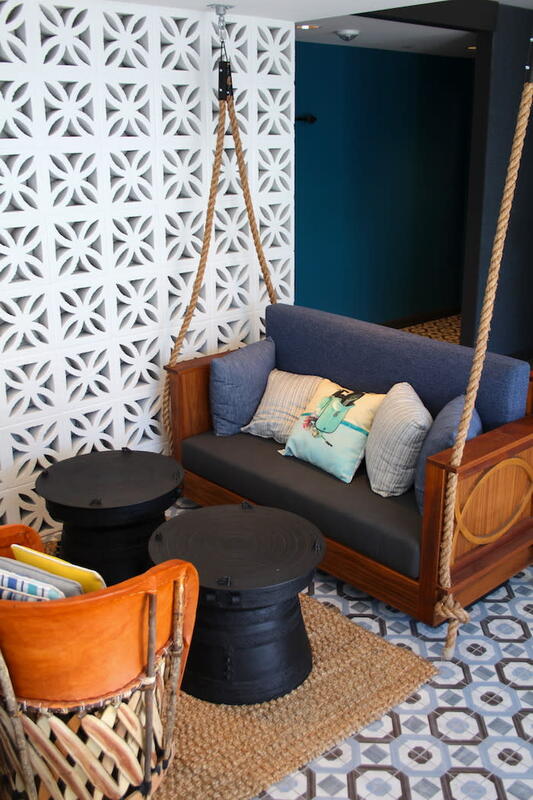 Step inside Pacific Hideaway, and you’ll be hit with international trinkets adorning the walls, a hand-carved wave bar, bungalow-style seating nooks, a Frida Kahlo mural, and geometric tile flooring that runs under modern garage doors and onto the dog-friendly ocean-view patio. 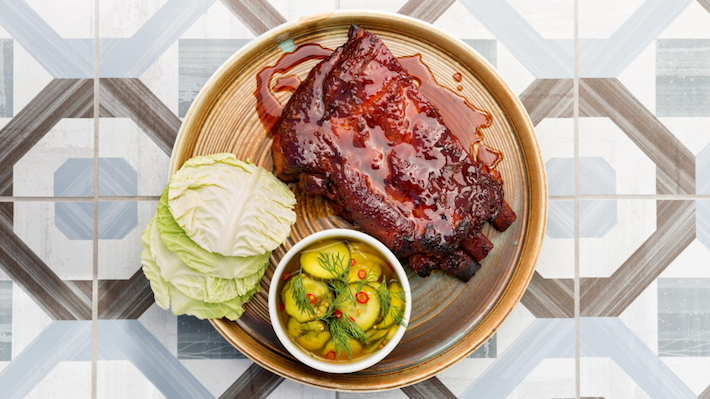 As you sit down for breakfast, brunch, lunch, dinner, dessert, or just a seasonal sip, you’ll meet carefully curated, ever-evolving menus starring tweaks and twists on your favorites. Start your day with something sweet and/or savory, from Porridge with quinoa and toasted coconut and the standard California Breakfast Burrito to Huevos Rancheros and Smoked Salmon with bagel chips. Follow with lunch or dinner, featuring family-style shared plates, like the killer aforementioned Crispy Snapper platter, Beer Can Game Hen, and Pan-Roasted Wahoo, plus smaller numbers like the crunchy Avocado Tacos, fresh Oysters from the Raw menu, and Loaded Waffle Fries. Wash it all down with one (or two) of Casey’s playful cocktails, then top it off with dessert, say the House-Made Ice Cream or Yuzu-Lemon Tart. Don’t forget your pup! On the breezy patio, canine companions dine on Chef JT’s made-from-scatch beef, chicken, and fish bowls. Come June, go for “Four-Legged Fridays,” where a small or large human plate will score your furry friend a complimentary treat. Speaking of specials, “happy hour is the way of the world,” according to Blake, who detailed the Hideaway’s planned offerings. Monday through Friday from 4-7 p.m., guests can sip $5 glasses of seasonal red and white wines, $2 off all draft beer, and $3 PBR, “because deep down inside all of HB loves classic cars and PBRs.” Happy hour bites include a $2 daily taco along with discounted Chicharrones and Crispy Calamari. In a couple months the Hideaway plans to roll out its “The OGHB” (The Original Guest of Huntington Beach) loyalty program for locals. Frequent guests will be handed exclusive cards embossed with their names, catering to a unique experience with ambiguous perks. Flash your card and maybe you’ll be treated to a round of drinks from Casey, an amuse-bouche from Chef JT, or a percentage off of your bill. They’ll keep you guessing, and coming back for more. For events, Pacific Hideaway has created two stunning banquet spaces in its rear, thoughtfully carving room for every occasion, from corporate meetings to private dining. Catch you at the Hideaway, friends. Brunch: Saturday & Sunday, 7 a.m.-2 p.m. Lunch: Monday-Friday, 11 a.m.-3 p.m.
Dinner: Sunday-Thursday, 3-10 p.m.; Friday & Saturday, 3-11 p.m.